Mani Square, one of Kolkata’s most exciting retail projects, is a mixed-use real estate developmentwith a Shopping Mall at its hub, combined With the best of leisure and entertainment options as well as a state-of-the-art IT Park with all facilities and a service infrastructure that measures up to international standards. Mani square is spectacularly situated next to Apollo Gleneagles Hospital – in the neighborhood of the Hyatt Regency, Swabhumi and Subhas Sarobar – off Salt Lake. The area is set to be the heart of tomorrow’s Chowringhee the most happening place in the emerging city. By virtue of its location, it caters to the huge cash rich catchments of Salt Lake, Lake Town, Phoolbagan, Kankurgachi and other areas of north and est Kolkata. Sprawling over more than four acres of prime land having a frontage in excess of 80 metres on the EM Bypass, the total size of the development is over 7 lakh sq.ft. It has a swank retail section – taking up over 3 lakh sq.ft. – and fabulous dining, entertainment and leisure options. It houses the first and only IMAX cinema in the city of Kolkata bringing with it DMR technology for the first time. The mall is organized into various zones for specific segments – Fashion, Lifestyle, Casual & Trendy, Beauty and Fitness, Home & Decor, etc. 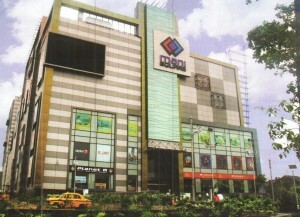 You can view the list of Stores / Shops at Mani Square mall Kolkata here.